This last December when we visited the Nubian House Luxor, I looked for the “Blessing of the River” carpet. It had been sold, and I missed the story. 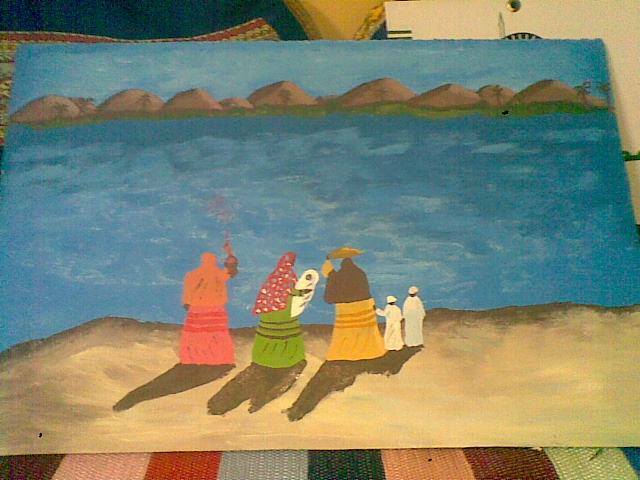 Now Mr. Gamal has painted this scene for us, and he also forwarded the video we saw last week. Last week we saw the “Blessing of the River” video, now we will continue with a couple of applicable concepts. Normally in the sabou’a ritual the women of the family celebrate the week-old baby. With different Nubian groups some celebrate on the 3, 5, or 7th day. Fadwa al-Guindi ³ observed some Nubian groups sequencing both the sabou’a and then the “Blessing of the River” after her confinement. At the sabou’a they go to the Nile where they offer dishes of specific foods to the malayket-al-bahr (river angels), after which they fill the dishes with river water and bring them home. Other Nubian groups do not do the sabou’a, only the “Blessing of the River” after their confinement. During the Nubian sabou’a and “Blessing of the River” the malayket-al-bahr are fed and called to, often Nile water is brought back for both ritual washing of the mother, to be sprinkled in the house “to fill [it] with life” and for keeping in open bowls. If one drops gifts or items in the bowl, the Nile water and the good spirits in it dispels any evil spirits. This video is titled “Sabou’a” but it could also be the 40 day “Blessing of the River”. With its overlay of Nubian music, the filming of this is a bit theatricalized; the camera and crew altered the ritual a bit. According to those I asked; the parts of the ritual done by the women were authentic, when men were acting it was an add on for the film. :00 The video starts with a woman carrying the ritual food in a basket on her head, followed by the mother with baby, followed by female family, neighbors and children. Normally men would not be there, but with a video camera-person and crew filming the women, of course it would be normal for a couple men to supervise the situation and make sure the women and children were protected. :48 The “old lady” throws lumps of food into the Nile. Most accounts say that she throws 7 lumps, this video only shows two of them. An “old lady” has more knowledge and is respected for this. :58 The “old lady” talks to the camera, talking about praying for good husbands for the young ladies, as the young ladies laugh and smile behind her. Her words are translated into Arabic, since they are probably in one of two Nubian languages; Kensi or Fadiki. We momentarily see the mother and new baby. The lady continues talking, then she returns to throwing food into the water to call the malayket-al-bahr and fish. 1:44 Women scoop up the river water, notice they are wearing the jarjar black lace overdress. 1:47 Children eat the sweetened milk-rice (after lumps are thrown to the river), then women join them. 2:01 It is part of the ritual to send a little boat carrying some ritual food into the river, it is a film add-on for men to put a candle in it. ¹ Thank you Mr. Gamal Latif for supporting our understanding of Nubian Culture through your stories, paintings, interviews and my neverending questions. 4 Boddy, Janice; Wombs and Alien Spirits, The University of Wisconsin Press, 1989. I truly appreciate your efforts, Sahra, to bring us real folklore. I truly enjoyed Nubian Baby Ritual Part I and II and I think that it is absolutely fascinating that the Nubians fashion this ritual after Moses, who was cast into the river Nile thousands of years ago. What an amazing land Egypt is. It contains the roots of civilization, incomprehensible ancient technology and craftmanship, idolatry, paganism and sun worship, roots of occult, freemasonry and also roots of Judaism and Christianity.All present in one amazing land inhabited by its resilient people surviving any oppressor even on a barren sand by a salty ocean.